Honor Note 10 Has 5,000mAh Battery, Confirms Honor - Playfuldroid! 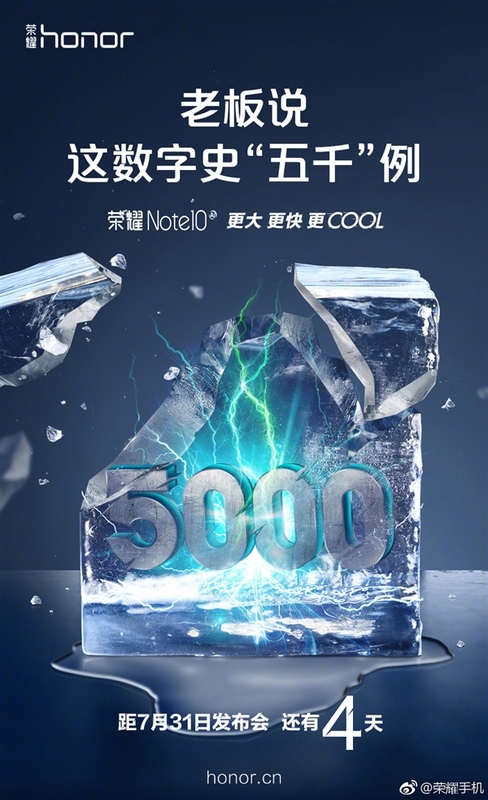 Honor Note 10 has already appeared with all its specifications on the website of TENAA, the telecom authority from China. The handset that will be arriving with a mammoth display of 6.9 inches is also expected to feature a big battery. With 4 days remaining for the launch of the Honor Note 10, the Chinese manufacturer has today confirmed the exact size of the battery of the smartphone through its official Weibo account. The specifications of the Honor Note 10 smartphone that has been revealed through its TENAA listing include 6.95-inch S-AMOLED display, Kirin 970 SoC, up to 8 GB of RAM, up to 512 GB of storage, 16-megapixel + 24-megapixel dual camera setup, 13-megapixel front-facing camera and Android 8.1 Oreo.